VoIP Call Recording: Can VoIP Calls Be Recorded? For the average person, recording phone calls is something done by police departments or multinational corporations. This is mostly true when it comes to PSTN lines where recording calls required hardware and/or software, along with legal permission. In many countries wiretapping is illegal for private individuals and law enforcement officials often take a hostile view of anyone doing so, even if it is only for a prank or some harmless purpose. Can you record VoIP calls? As most of the world is upgrading to VoIP, people wonder if VoIP calls can be recorded or not. There are actually two ways to answer this question depending on which perspective is required. Technically speaking, recording VoIP calls is not very difficult as they are simply packets being transferred over data networks. Most VoIP vendors offer some form of call recording features, whether it is included for free or charged for as an extra. The other perspective is legal and privacy considerations. Different nations may have varying legislation that governs who can record phone calls, when and whether or not consent is required from the other party. For instance, some countries make it illegal for individuals to record calls under any circumstances while organizations can do so under specific regulations. In others, both individuals and organizations can record calls providing all parties in the call are aware that it is being done. Sometimes laws are different within the same country as well. Within the United States, many states operate under a “one party consent” law which states that calls can be recorded as long as you are a party to the conversation. In others, all parties to the conversation should consent before recording can proceed. It is best to keep in mind the distinction between whether you can record calls versus whether you should! For individuals, recording VoIP calls is generally not a daily requirement but something that is needed perhaps a few times a year. Professionals may need to record calls especially if they frequently interview people over the phone for news reports, work as publicists, publish podcasts etc. For enterprises, the purpose of recording VoIP calls can be vastly different and also required on a daily basis. Organizations may want to record calls for reviewing the interactions of customer service reps with callers in order to improve quality, for training new agents and for employee evaluation. They may want comply with legal and regulatory requirements, especially if the organization is involved in a legal action. Call recording is also useful to keep a record of interactions with suppliers, distributors, partners and important clients. Increasingly, security is becoming the biggest reason for recording VoIP calls. Quite often, organizations are being breached using information obtained through conversations with their employees by unauthorized users. Companies are also worried about losing confidential data, contracts or revenue due to information being leaked – intentionally or accidentally. There are two ways of recording VoIP calls commonly referred to as passive and active recording. Passive recording happened when packets are captured through packet sniffing tools. On the other hand, active recording happens when the vendor’s software becomes part of the conversation by listening in. Most vendors offer some sort of active recording solution for enterprises. In general, recording VoIP calls does not require special equipment or even specific software. It is a feature that is built into whatever application is offered by the vendor or by third-party clients. All it takes is to turn on a setting or press a button in the software. VoIP providers offer fine-grained control over who can record calls, under what circumstances and whether or not to include a voiceover that informs all parties about the recording. Sometimes organizations may want to enable the call recording for everybody in a particular department or only for specific individuals. The settings may even be changed on an individual or per call basis that does not interfere with the global setting. Once the call has been recorded, it can be saved as an audio file, stored, archived and played back later just like any music file. 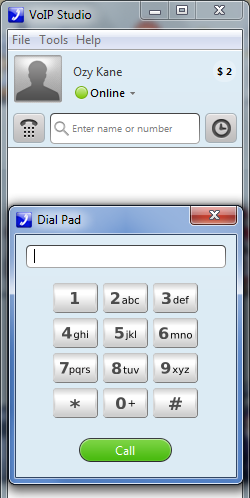 Most users will have the VoIPstudio icon in the system tray so that incoming calls can be answered. If not, double-click the shortcut on the desktop or elsewhere to open up the program. Start a call by dialing a number you know or selecting from your list of contacts. Once the call starts, you can record it by clicking the record button at the bottom of the call window. When you do so, a new window will open up asking where to save the recorded file. Select any location on your computer and press the save button. VoIP call recording can be toggled so that it is either automatic or must be enabled for each call. There are advantages to both settings and organizations can choose which one fits their requirements better. Automatic recording means that individuals do not have to remember to turn it on for specific conversations but it also means that large amounts of data will be generated. All the recordings will have to be stored somewhere and also comply with security and privacy legislation. Manually recording each call means that only important conversations will be retained but it means that each user has to remember to turn it on. Sometimes an employee may forget to record calls that were actually important. Some companies enable automatic recording for specific departments such as sales, customer support etc. while others like accounts or HR can turn it on when required. We are looking for a solution to add to our installed VOIP system, all we need is the ability to record a call on the fly if needed, will this work with out current VOIP system?